Welcome to the first part of this blog’s first series, Bad Games I Played a Lot. As the name suggests, I talk about games that, in hindsight, were pretty bad even for their time (this is important), but that, for some reason, I played for a long time. And the first one is… Kung Fu Master, on the ZX Spectrum. And, so, 1986 arrived. It was late summer, so I was 13 then (my birthday is in July), and when, through the first Sinclair User I bought (I had been a Your Sinclair guy until then), I found out that Kung Fu Master had been released for my trusty Spectrum 48K (actually, a TC2048), I was thrilled. Yes, the review (which didn’t include any screenshots — that was common, at the time) only gave it 3 stars out of 5, but what was that to me? I could play Kung Fu Master at home! When I eventually purchased a copy, that is. Which happened a month or two later. Well, the Spectrum port was… interesting. And not exactly in a good way. Don’t just look at the preview screen, watch the video. Go on. I’ll wait. Neither of which, I’m sure you’ve noticed, the Spectrum version includes. Hell, even the much less powerful Atari 2600 did them right! It’s as if the Speccy version’s programmers weren’t even trying. But, hell, I played it a lot. Even after I completed it (it was hard, but not that hard), I kept playing it on and off for years. Why is that, I wonder? Well, I guess that some of it is the “emotional investment” I had in the game, from spending hours watching other people playing it at the arcades. Being able to play it in some form (and, except for the lack of the three features listed above, the Speccy port actually reproduced the five levels pretty well), at home, when ever I wanted, was something special to the kid I was back then. Plus, the game was hard. 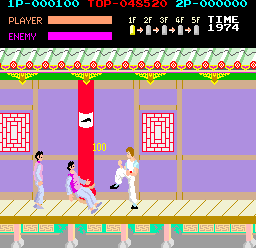 Unfairly hard, in a way; unlike the arcade version and most of the ports, your attacks were slow and only connected at a certain point, so you couldn’t simply hit the punch or kick button repeatedly when an enemy was approaching; you really had to time your attacks so you hit your foes at the end of the punch/kick animation. Also, the “flip screen disguised as scrolling” (which was dumb; I think it was that way mostly to hide the color clash, since the Spectrum could do pretty decent scrolling) only made the game harder, since you could be hit during the “scrolling” (you could attack, too, though), and if an enemy was approaching at a certain distance, he would seem to appear from nowhere during the “scrolling” animation, giving you little to no time to defend yourself. I’ve got to admit, though: the music, while (again, unlike every other port, even the Atari 2600 one) having nothing to do with the arcade version, was… intriguing. Not really “good” (though it was technically impressive for a Spectrum 48K game, as the computer didn’t have a dedicated sound chip and couldn’t do anything while it was playing a sound; it had to play sounds during the “free computing time” between every frame of animation; few 48K games had music during the game; I think Manic Miner (1983) was the first, and I can’t recall any one after KFM), but it had a… mysterious? quality to it. Somehow, I can remember and hum or whistle it perfectly, at any time, even after decades. As a related subject, which Kung Fu Master port do I consider the best? And the worst? Well, for a start, I’ll choose only from those I know (even if just from emulation), which are all of the above, plus the Amstrad CPC version, which is very close to the C64 one; they were converted by the same team, and while the backgrounds are different, the character sprites look like a “least common denominator” between the two computers, and are almost the same. The CPC version has no music, though (not due to system limitations; most Amstrad games did have music). As for the best version, I think it’s the Commodore 64 version, though not by far. It’s fast, relatively well animated, and more faithful to the arcade than most. It’s not perfect; the Commodore is able to do much better and, as I said, there’s the “least common denominator between the C64 and the Amstrad” sprites. It’s also perhaps too easy. The NES and CPC versions lose in terms of smoothness and, especially the NES version, in terms of replicating the arcade experience. It’s also even easier than the Commodore 64 version, which makes a game one can complete on day one… never a good thing. The Atari 2600 version is a surprise; while the three versions above (and the one to be mentioned next) don’t take advantage of what any of the systems can do (not even close, in fact; they’re all pretty lazy ports, IMO), a game such as that 2600 port shouldn’t even be possible on such a puny system. In other words: it’s breathtaking in technical terms; remember that we’re talking about a console from 1978 which usually had much more basic, single-screen games. So, kudos to this port for going (far) above and beyond the call of duty. The worst version, among those I know? It has to be the one this post is about: the ZX Spectrum version, for the reasons noted in the post. Again, note that this isn’t a case of being the most limited system (it isn’t); the Speccy is capable of much better. Take a look at the “pretty decent scrolling” link in the post to see what I mean. Previous Previous post: Is this the best-looking water in a videogame?